At General Metal Engraving our reputation is engraved on every die. Meticulous Workmanship That Works for you. When it comes to rotary dies, General Metal Engraving is a cut above. For nearly 40 years we've set the standard in excellence. From custom design, to precision tooling to production implementation, our full-service operation ensures that you'll run at peak capacity. Inventors of the vacuum die continue to transform the industry. Over 25 years ago, General Metal Engraving founder Sarkis Kumjian pioneered an engineering marvel: the vacuum die. He saw an industry wide problem, eliminating web waste, and developed this innovative solution. Using a vacuum attachment, the die picks up debris from the web and pulls it through the die journal. 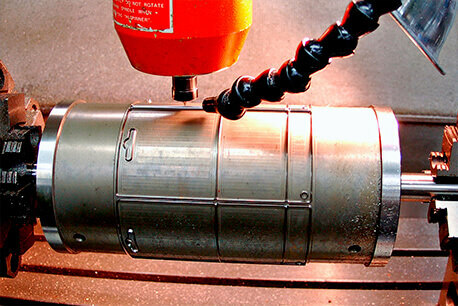 Scraps are drawn inside the cavity and pass through the die cutting system. The end result is a cleaner work site and less litter that can clog up your operation. Our vacuum die also allows you to punch holes AND cut a shape with one pass – all while waste is whisked away. This eliminates expensive male-female punching and unneeded production time. We're tough on our dies, so they'll hang tough on your press. Unlike our competition, our dies aren't simply surface treated or made of inferior metals. We take our dies to the max to bring maximum productivity and performance to you. We work with you to determine the right combination of steel and treatments that will perform the best for your particular job at the optimum price. This adds up to one thing: you'll get more revolutions and that means more value. GME dies are so well made that you'll run longer between sharpenings AND have more retoolings over their life cyoperation. We engrave deeper and know how to finish the blad for maximum wear resistance. When you need it now, GME doesn't tool around. Tight turnaround times are no problem. Whether it's a quick question, a competitive quote or a rapid response, we're on it. Your individual needs are our first priority. And we ensure timely delivery even while we assure the highest quality control. Our production process includes proof approvals and tolerance certification.